Last night I witnessed XENOS, yet another moving performance by British dancer Akram Khan. The National Arts Centre (NAC) and Akram have a special relationship and history. Akram performed his first solo work at the NAC in 2001 and has since returned to Ottawa 6 more times to perform his incredible work. This weekend XENOS premieres in North America in this co-production with the NAC. As with all of Akram’s work, music and soundscapes play an important role in setting the tone. The performance is syncopated with abrupt ruptures of sound, a reminder of the discombobulation that occurs when one finds themselves removed from what is familiar. Akram Khan is irrefutably one of the most innovative dance artists in the world. His highly collaborative interdisciplinary works shift between classical kathak and contemporary dance. For his new solo, he tells the tale of an Indian colonial soldier in the First World War, expressing both the beauty and horror of the human condition. XENOS takes place on the border between East and West, past and present, mythology and technology, where humanity stands in wonder and disarray. Don’t miss this final chance to see Akram perform as a dancer in a full-length work. Ottawa loves Akram! 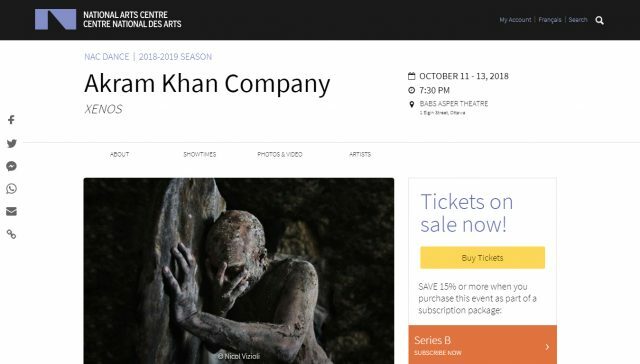 The theatre was full and no doubt, the rest of this weekend’s performances the Akram Khan Company will play to a packed house. A reminder, the NAC offers rush tickets for $15 if you are under 30 years of age and sets aside 1/2 price student tickets for every show.